One of St Mary's unique features is the Lauderdale Aisle which was the church vestry, pre-Reformation. It is built to the North of the choir and the chapel above the vault is now available for use by any Trinitarian church. Its history is interesting. The choir was left roofless after the siege of Haddington and remained so until 1973. After the Reformation, it was common for powerful men to acquire rights to church property that was no longer in active use. Around 1590, the Lord Chancellor, John,1st Lord Maitland had the friendship of King James VI and was allowed to use this vestry as his mortuary aisle. 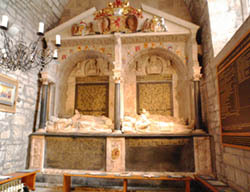 Chancellor John died in 1595 and was buried in the vault. His son John, the 1st Earl of Lauderdale, and both their wives were also buried there. A splendid monument in black marble and alabaster was erected against the East wall in 1675. It shows both Lords and their Ladies in peaceful slumber beneath an open pediment bearing gilded coats of arms of their families and the Lion Rampant of Scotland. This monument was erected by the 2nd Earl of Lauderdale (1616/1682), a most powerful man who virtually ran Scotland for King Charles II. He was not popular in Scotland and, although 2000 horsemen attended his funeral in Haddington, there is no memorial to him. Following the restoration of St Mary's in 1973, Patrick Maitland, the 17th Earl restored the Aisle as a family chapel and then in 1978 it was re-consecrated as a chapel dedicated to the Virgin Mary, the Christ Child and the Three Kings. Carved figures by an Oberammergau woodcarver on the south wall depict the Three Kings paying homage to the Christ Child. An icon from Mount Athos on the west wall shows a similar scene. The burial vault is not open to visitors.